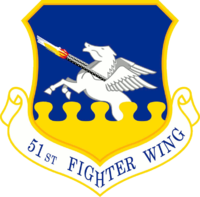 The 51st Fighter Wing (51 FW) is a wing of the United States Air Force and the host unit at Osan Air Base, South Korea. The wing has been based entirely in the Far East during its entire existence, including its combat role was as the 51st Fighter-Interceptor Wing during the Korean War. The 51st Fighter Wing is under Pacific Air Forces' Seventh Air Force. The unit is the most forward deployed wing in the world, providing combat ready forces for close air support, air strike control, counter air, interdiction, theater airlift, and communications in the defense of the Republic of Korea. The wing executes military operations to bed-down, maintain and employ follow-on forces for the combined arms base that includes three major flying tenants and large multi-service fighting units. The wing is equipped with General Dynamics F-16 Fighting Falcon and Fairchild Republic A-10 Thunderbolt II squadrons and myriad base support agencies conducting the full spectrum of missions providing for the defense of the Republic of Korea. Conducting exercises to ensure our forces maintain the highest degree of readiness to defend Osan AB against air and ground attack. Maintaining and administering U.S. operations at Osan and five collocated operating bases—Taegu, Suwon, Kwang Ju, Kimhae and Cheong Ju – for reception and bed-down of follow-on forces. Providing timely and accurate air power in support of military operations directed by higher headquarters. The 51st Fighter Wing is composed of four groups each with specific functions. The Operations Group controls all flying and airfield operations. The Maintenance Group performs maintenance of aircraft, ground equipment and aircraft components. The Mission Support Group has a wide range of responsibilities but a few of its functions are Security, Civil Engineering, Communications, Personnel Management, Logistics, Services and Contracting support, whilst the Medical Group provides medical and dental care. In 1948, assumed air defense of Ryukyu Islands. North American F-86E-10-NA Sabres of the 25th Fighter-Interceptor Squadron (51st) FBG over Korea. Identifiable is serial is 51-2742. It entered combat service flying the F-80C Shooting Star on 22 September of that year, when it moved to Itazuke AB, Japan, to support the breakout of the Eighth U.S. Army from the Pusan Perimeter. For nearly 4 years thereafter, the 51st FIW played a key role in the defense of South Korea despite moving to four different locations within a year and operating under austere conditions. The wing moved to South Korea in October only to return to Japan in December, leaving combat elements behind. In May 1951, the 51st FIW moved to Suwon Air Base, southwest of Seoul, but retained maintenance and supply elements at Tsuiki AB, Japan, to provide rear echelon support. In November 1951 the 51st FIW transitioned to the F-86 Sabre with two squadrons (16th, 25th), adding a third squadron (26th) the following May. The group operated a detachment at Suwon AB, Korea, beginning in May 1951, and relocated there in October 1951, with maintenance and supply elements remaining in Japan until August 1954. The wing ceased combat on 27 July 1953. The 51 FIW's war record was impressive. Wing pilots flew more than 45,000 sorties and shot down 312 MiG-15s; this produced 14 air aces including the top ace of the war, Captain Joseph C. McConnell. The ratio of aerial victories to losses was 10 to 1. Unfortunately, the wing lost 32 pilots to enemy action; however, nine that became prisoners of war were repatriated later. Three 36th Fighter Squadron McDonnell Douglas F-4E-37-MC Phantoms in flight. Serials 68-0328 and 68-0365 identifiable. 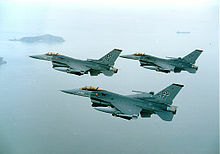 Three 36th Fighter Squadron F-16Cs in flight. At the same time, the wing demonstrated its mobility readiness in response to three regional crises. From August 1958 to January 1959, the 51 FIW deployed eight F-86Ds to Ching Chuan Kang Air Base Taiwan to fly combat air support missions for Nationalist Chinese forces after mainland Communist Chinese forces shelled the Nationalist-held islands of Quemoy and Matsu. Six years later, the wing deployed 12 F-102s to the Philippines and South Vietnam from August to October 1964 for air defense against possible Communist North Vietnamese air attacks. During the Vietnam War, crews of the 51st Fighter Interceptor Wing provided air defense of Naha AB, Okinawa, with F-102s. During the 1968 Pueblo crisis, the wing deployed 12 of is 33 aircraft to Suwon AB. On 31 May 1971, the 51st FIW was inactivated, ending almost 17 years of service in the Pacific from Naha when it was inactivated as the Air Force began scaling down its activities in Southeast Asia. In 1975 Naha Air Base closed. On 1 October 1993, after a half-dozen name changes, the wing returned to its original and current designation as the 51st Fighter Wing. Since then, the 51st has continued operating as a fighter/ground attack wing and continues to be tasked to receive and integrate follow-on reinforcing forces to the peninsula in the event of crisis. Redesignated: 51 Fighter Wing on 1 October 1993. 559th Tactical Fighter Squadron: attached 12 June – 15 November 1965. The 51st FW's aircrews have flown a variety of aircraft, including the P/F-51 Mustang, F-80 Shooting Star, F-82 Twin Mustang, F-86 Sabrejet, F-94 Starfire, F-102A Delta Dagger, F-4E Phantom II, RF-4C Phantom II, F-106A Delta Dart, OV-10 Bronco, A-10 and OA-10 Thunderbolt II and several versions of the F-16 Fighting Falcon. 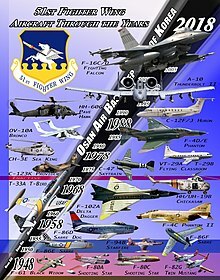 Historical Aircraft of the 51st Fighter Wing; Poster created by L. Vance Fleming, Historian for the 51st Fighter Wing. The photos used were from open-source sites. Not all aircraft were specifically assigned to the 51st Fighter Wing but are representative of the type of aircraft that were assigned. The list of commanders for the 51st Fighter Wing and its predecessors includes a wartime hero, Colonel Francis Gabreski, and an aviation pioneer, Tuskegee Airman Colonel Benjamin O. Davis Jr.
^ Okonski, John (26 July 2007). "Wing's shield preserves long heritage". 51st Fighter Wing History Office. ^ "Colonel William D. Betts". United States Air Force. July 2017. Retrieved 23 August 2017. ^ Fisher, Franklin (26 March 2004). "Osan airmen practice 'hot pit refueling'". Stars and Stripes. Not shutting off the engines saves turnaround time, said Capt. Dominick Martin, officer in charge of the 25th Aircraft Maintenance Unit, part of the 51st Aircraft Maintenance Squadron. ^ "Experienced commanders have led 'Mustang Stampede'". 51st Fighter Wing History Office. 26 July 2007. Retrieved 5 February 2017. ^ Barreiro, Jake (15 June 2015). "51st FW welcomes new commander". 51st Fighter Wing Public Affairs. Retrieved 15 July 2017. ^ Ramos, Franklin (28 July 2017). "51st Fighter Wing Change of Command Ceremony". 51st Fighter Wing Public Affairs. Retrieved 28 July 2017. This article contains information from the Osan Air Base factsheet which is an official document of the United States Government and is presumed to be in the public domain. Maurer, Maurer (1961). Air Force Combat Units of World War II History and Insignia. Zenger Publishing. ISBN 978-0-89201-092-9. Martin, Patrick (1994). Tail Code The Complete History of USAF Tactical Aircraft Tail Code Markings. Schiffer Publishing Limited. ISBN 978-0-88740-513-6. Ravenstein, Charles A.; United States Air Force, Office of Air Force History (1984). Air Force combat wings lineage and honors histories, 1947-1977. Air Force History & Museums program. ISBN 978-0-912799-12-4. Rogers, Brian (2005). United States Air Force Unit Designations Since 1978. Ian Allan Publishing. ISBN 978-1-85780-197-2. Thompson, Warren (1999). F-86 Sabre Fighter-Bomber Units Over Korea Frontline Color 1. Osprey Publishing Company. ISBN 978-1-85532-929-4. Thompson, Warren (2001). F-80 Shooting Star Units Over Korea. Osprey Publishing Company. ISBN 978-1-84176-225-8. Video from 1952, describing the day-to-day activities of the Wing.